Local non-profit organization Community Arts and Culture closes out its 10th Anniversary season with the Afro Roots World Music Festival. Celebrating 15 years of producing quality musical presentations throughout Miami Dade County, the festival has been able to expand its reach beyond local South Florida artists by bringing in performers from African countries such as Ghana, Senegal, Ivory Coast, Guinea, Mali, and the Republic of Congo. Furthermore, the festival celebrates the evolution of African culture in our community by presenting local artists that represent the musical cultures from Brazil, Cuba, Colombia, Haiti, and other Caribbean and American countries. This global connection through music has helped the festival evolve into one of Miami’s most culturally diverse events. Antilles Music Ensemble, APWO (Afro Polyphonic World Orchestra), CK Ladzekpo, Cortadito, Grupo Barrio Abajo, Ibrahima Dioubate & Fatala, ITAWE, Unidos de Miami Samba School, Venus Rising. DJ indoor stage DJ Moses, DJ outdoor stage: Lance O w/Kulcha Shok crew. Hosted by Majica & Mano P from Global Gumbo on WDNA 88.9 FM. 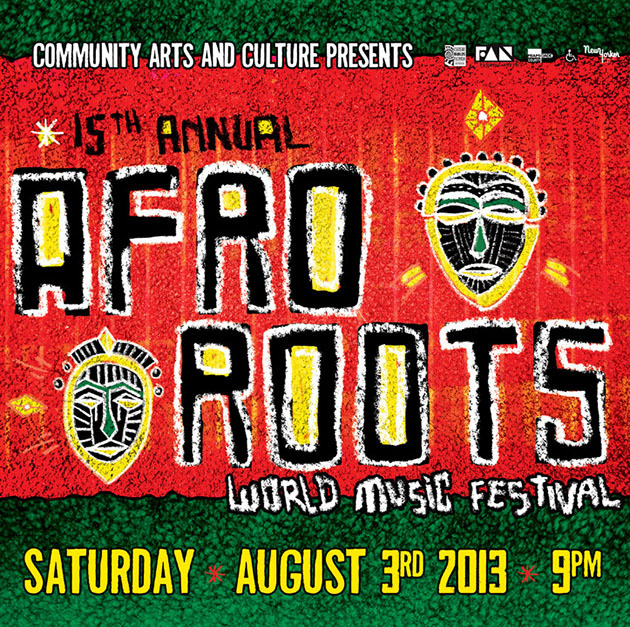 The 15th Annual Afro Roots World Music Festival will take place on Saturday, August 3rd at 7th Circuit Studios located at 228 NE 59 St., Miami, FL 33137. The evening will feature various showcases produced for this special anniversary year. Highlights include the Afro Polyphonic World Orchestra, a world music orchestra that collaborates with invited guests artists from around the globe. Itawe (pronounced E tah wi), lead singer of Locos Por Juana will be performing songs from his new reggae solo project. The Antilles Music Ensemble, representing the early days of Caribbean dance music from 1900 – 1950 and all points in between. This year the festival will also present two West African artists including master percussionist and founder of UC Berkeley’s African Music and Dance Ensemble, CK Ladzekpo from Ghana, and Master Balafonist and Griot, Ibrahima Dioubate from Guinea. Also representing Africa and collaborating with CK Ladzepko is the all women percussion and dance troupe Venus Rising. From Colombia we have Grupo Barrio Abajo performing their blend of Afro Colombian music from both coasts. Representing Brazil is the Unidos de Miami Samba School directed by Paulo Gualano. Finally, returning to the festival for a second year in a row is Cuban Son duo Cortadito, which will be expanding to a quintet for this year’s special performance. Sponsored by the Miami-Dade County Department of Cultural Affairs, Funding Arts Network, Florida Department of Cultural Affairs, the Little Haiti Cultural Center, Hotel New Yorker, and 7th Circuit Productions.